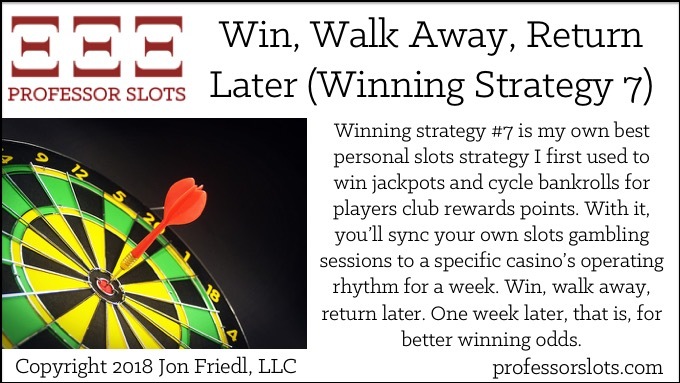 Winning strategy #7 is my own best personal slots strategy I first used to win jackpots and cycle bankrolls for players club rewards points. With it, you’ll sync your own slots gambling sessions to a specific casino’s operating rhythm for a week. Win, walk away, return later. One week later, that is, for better winning odds. 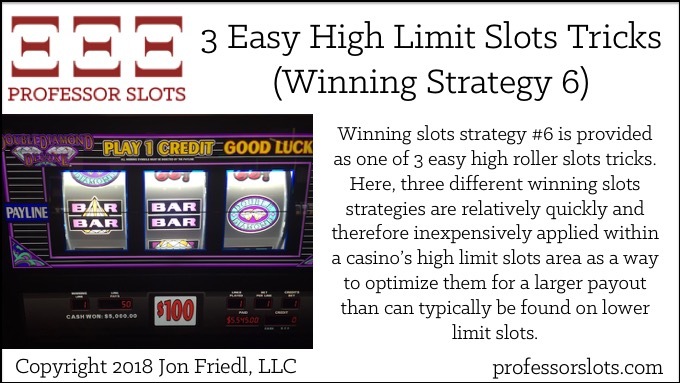 Winning slots strategy #6 is provided as one of 3 easy high roller slots tricks. Here, three different winning slots strategies are relatively quickly and therefore inexpensively applied within a casino’s high limit slots area as a way to optimize them for a larger payout than can typically be found on lower limit slots. 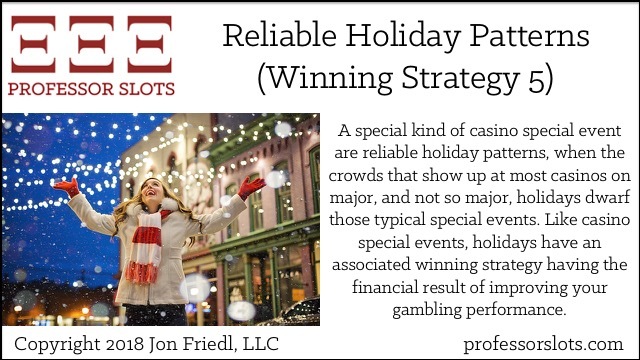 A special kind of casino special event are reliable holiday patterns, when the crowds that show up at most casinos on major, and not so major, holidays dwarf those typical special events. Like casino special events, holidays have an associated winning strategy having the financial result of improving your gambling performance. 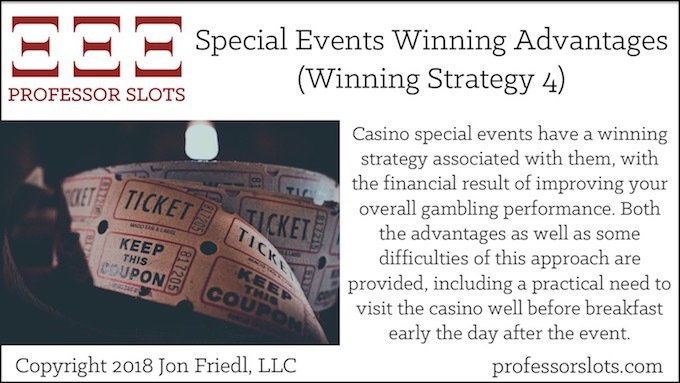 Casino special events have a winning strategy associated with them, with the financial result of improving your overall gambling performance. Both the advantages as well as some difficulties of this approach are provided, including a practical need to visit the casino well before breakfast early the day after the event. Much has changed in the gaming industry over the last 10 years, with so many more casinos available closer to home for most people. One important aspect that has not changed is the Five Ways Nevada Leads World Gaming Industry. 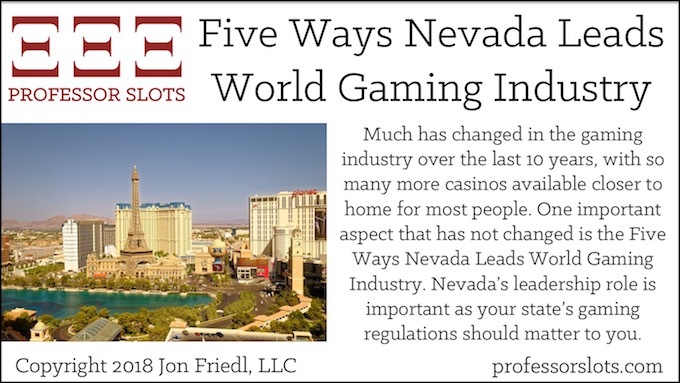 Nevada’s leadership role is important as your state’s gaming regulations should matter to you. 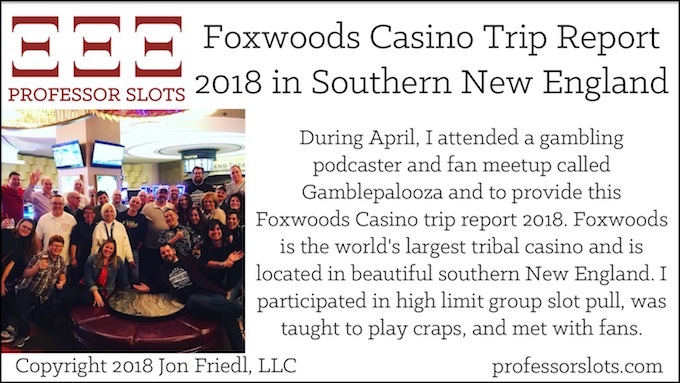 During April, I attended a gambling podcaster and fan meetup called Gamblepalooza and to provide this Foxwoods Casino trip report 2018. Foxwoods is the world’s largest tribal casino and is located in beautiful southern New England. I participated in high limit group slot pull, was taught to play craps, and met with fans.